Call us for a free foundation wall repair quote today! We serve Superior, Duluth, Minneapolis, and many nearby areas in Minnesota and Wisconsin. At DBS, we take pride in leaving each job clean, neat, and free of damage to existing landscaping. As part of our cleanup process, we fill holes completely with dirt saved earlier and tamp filled areas to ensure that depressed areas will not be created as the soils settle over time. When we at DBS encounter this kind of problem, we suggest that you install our PowerBrace™ Foundation Wall System. Looking For Foundation Wall Repair Experts In Minnesota and Wisconsin? At DBS, we're proud to provide warrantied solutions that will permanently solve issues with bowing, buckling foundation walls. We provide free, no-obligation foundation wall repair estimates to homeowners throughout our Minnesota and Wisconsin service area. Each estimate is made in person, on site, and is presented in writing. 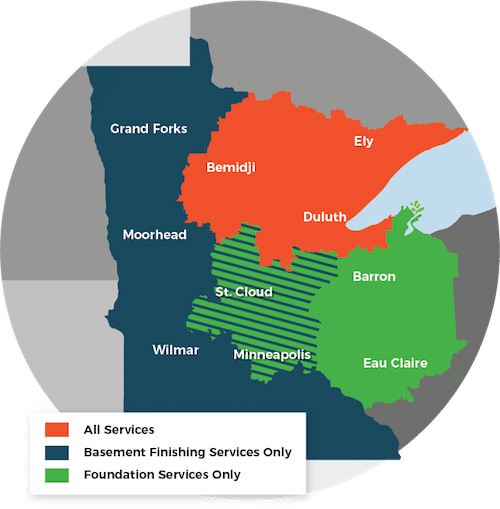 Our service area includes Minneapolis, Superior, Duluth, and nearby areas such as Two Harbors, Cloquet, St. Paul, Hermantown, Virginia, Ashland, Esko. Call or e-mail us today!